We are going on a journey today! Not a long trip, a short bus ride actually. But to many of the Amble Originals, anything that involves going beyond the village boundary is an adventure! Right, according to my watch it’s eight-thirty. There’s only one bus each morning and it leaves at eight-fifty, so we need to get a move on. We are off to the nearest town, Bustleton. It’s only small. There’s a street of shops, a couple of pubs, a superstore, a church; all the usual things. Come on bus, where are you? It’s Market Day today. Arthur’s taking his cows to auction. He’s decided to say goodbye to them. He put them in his trailer, and he’s towing it with his tractor so there will be some very frustrated motorists in his wake! Where has the bus got to? The kids go to school there. I went to school there! I was rubbish at school. You? Where on earth is the bus? There’s a shoppers market too. I need some apples. Also, some ladies tights and some makeup. What are you laughing at? All will become clear later in the month! The bus is terribly late. What’s the time? On no! My watch still says eight-thirty! It must have stopped before we set off! Oh well, you probably wouldn’t have liked Bustleton anyway. Tomorrow I’ll be telling you about Karaoke nights at the Fish Inn. You'll need earplugs! I love taking this journey. I feel like I'm right there meeting the people and seeing the sites. Can hardly wait to see what tomorrow brings. And the next day. And the next. The best is yet to come Trudy! So glad you are enoying it. Ha, ha! Funny, made me laugh! Thanks. My pleasure Beth. Thank you. I love "It's only small." What kinda town is it? It's only small. Nothing else, just small. Well, it's kinda' small! Cheers John. Shucks! Well, its the beginning of another journey then..
Another day another journey! Thanks so much. Too often Hilary! I missed my bus to Hailsham only yesterday for that very reason! Oh I was looking forward to Bustleton! J is for Journaling as you Build a Better Blog. #AtoZchallenge. There's another bus this afternnon Shirley! Why do you need tights? Hahaha - what a pity your watch stopped. I'm concerned about Arthur's cows. Having fun reading this. ...and I'm having fun writing it! Thank you K.
Ah Bustleton...the name suggests it's busier than Amble Bay. I'm kinda disappointed. Bummer about your watch. It never happens to me because I don't wear one. I thoght I'd get a portable sundial. Now where's North? You've really not missed much DeeDee! Hahaha...end made me feel so light and peppy! Yes, grapes are sour for the fox! Definitely would not have loved Bustleton today... may be some other day!!! hahahaha!!! I was so lost in the story and laughing about it... that forgot to leave my digital foot print here!! So glad you liked it! Now let's folow your footprints! Very funny. Bet I would have enjoyed visiting the town. I think you would prefer the village Darla! I wonder if his watch stopped by accident, or is Amble Bay a bit more sinister, like once you're there, you can't escape...?! Uh oh! Too bad you missed the bus. Intrigued by the ladies tights and makeup. Are you participating in a cabaret of some sort? Looking forward to learn more. Cheers! Not telling! Cheers to you too Debbie. Bustleton is probably a bit too bustling for many of the Amble Originals, I bet! I'm starting to see these as perfect shorties, maybe chapters, for youngers just getting into reading. They're brief, fascinating, and fun. Interesting thought Jacqui, who knows? I decided to write in a style differnt from my usual just to see what the reaction would be, and it's been quite a eye opener. I am quite sure I prefer Amble Bay to Bustleton. Not a city person, nor a superstore one...I do like bus trips though, so can I just go there and not get off? There's always tomorrow, if you really need to get those things. I can't because I'm meeting you lot at the lake! I lived in a village with only one bus a day - very frustrating! 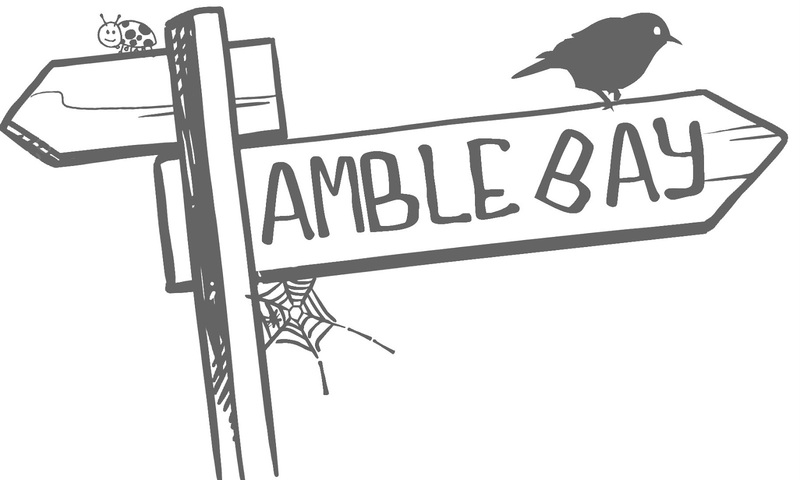 Amble Bay does seem to be where you belong! I have based the whole thing on a village I lived in for many years. I ran the pub there. Thanks Quiet One. Oh! i would have liked the trip to the Bustleton. Where on earth is the bus? We missed it thanks to my stupid watch Shilpa! "some ladies tights and some makeup" Hmm, I wonder what you are upto! Let's hope you can get your watch fixed before the next trip. Here's some virtual money to cover the repair bills! So kind of you Shweta. My watch asked me to thank you! Tights and make up? You'll just have to wait wait! That's probably because I spend so much time waiting for buses! And yes, I often wait in vain! Bustleton was probably a silly place. ;) More than happy to keep strolling around Amble Bay!